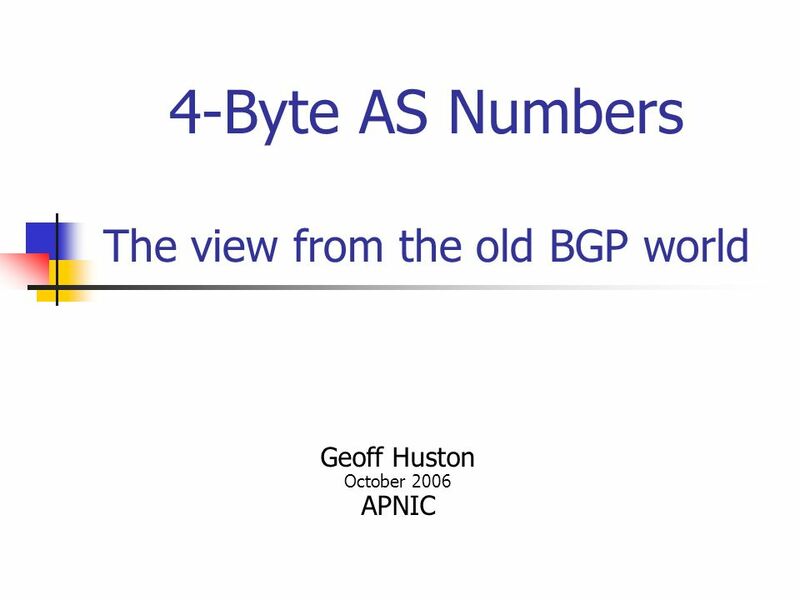 4-Byte AS Numbers The view from the old BGP world Geoff Huston October 2006 APNIC. 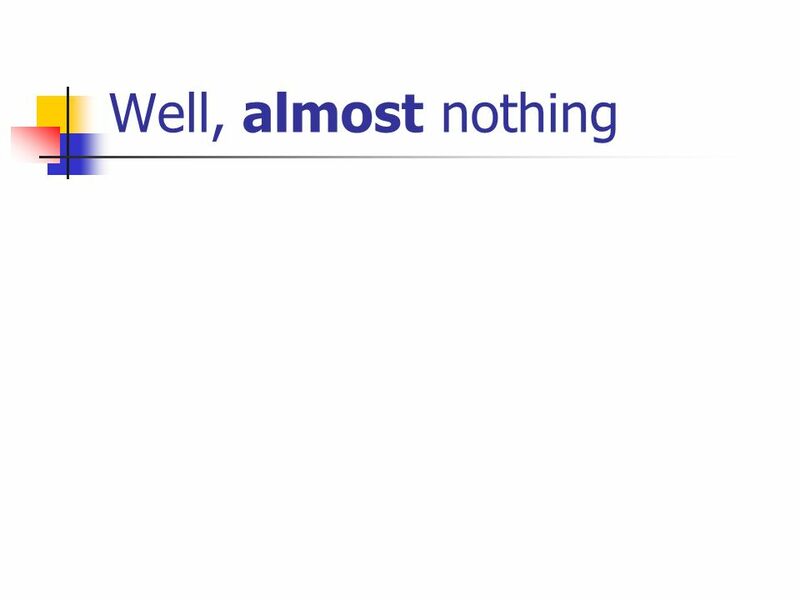 4 What does this imply? 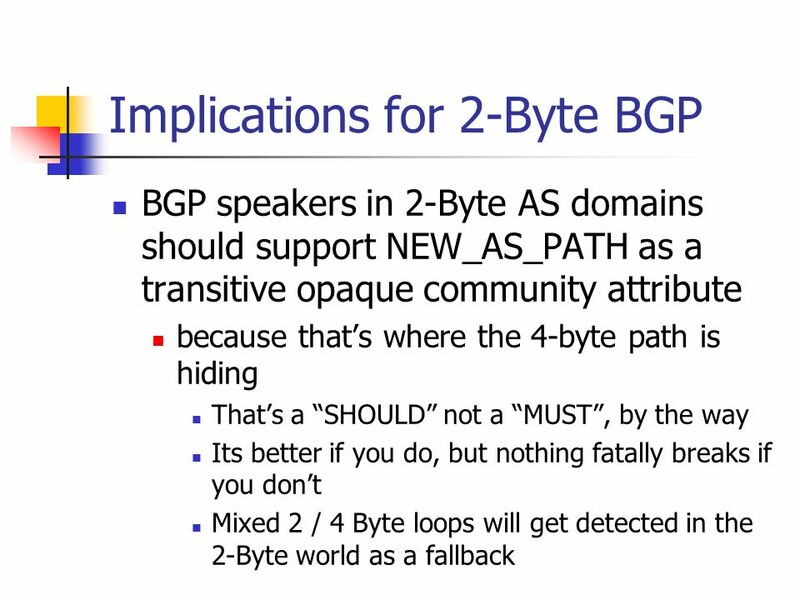 If you are a 2 Byte AS as all of you are today and you dont want to upgrade all your instances of BGP something you probably want to avoid then you dont have to do anything at all! 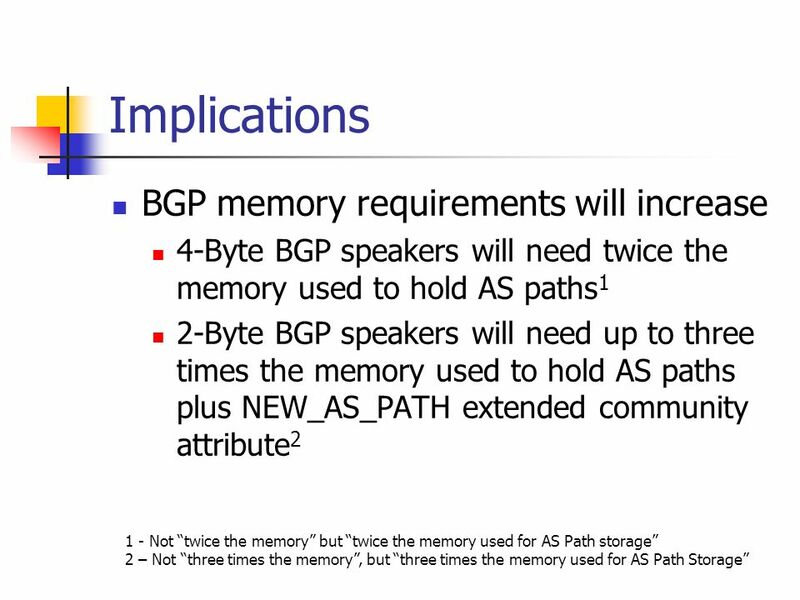 Download ppt "4-Byte AS Numbers The view from the old BGP world Geoff Huston October 2006 APNIC." 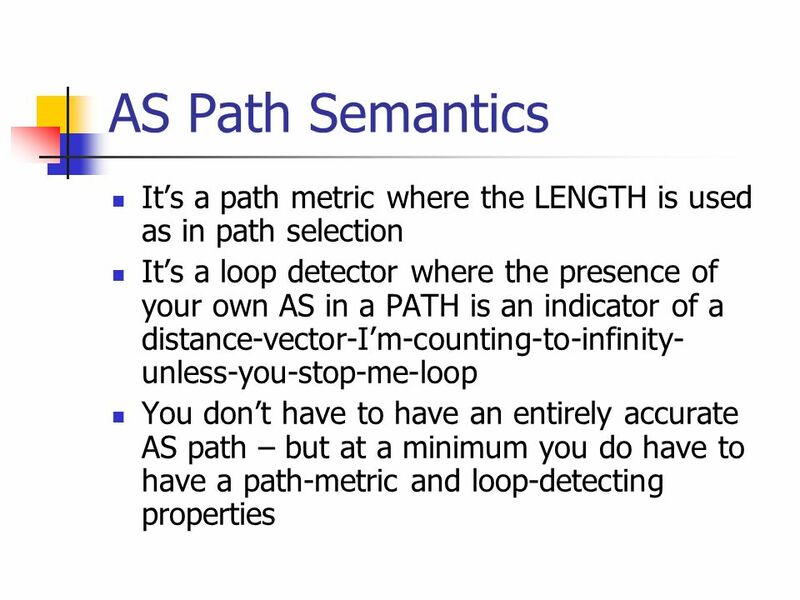 NOPEER Route Attribute Propose a well-known transitive advisory scope attribute Applied by originating AS to route prefixes Interpretable as advice to. 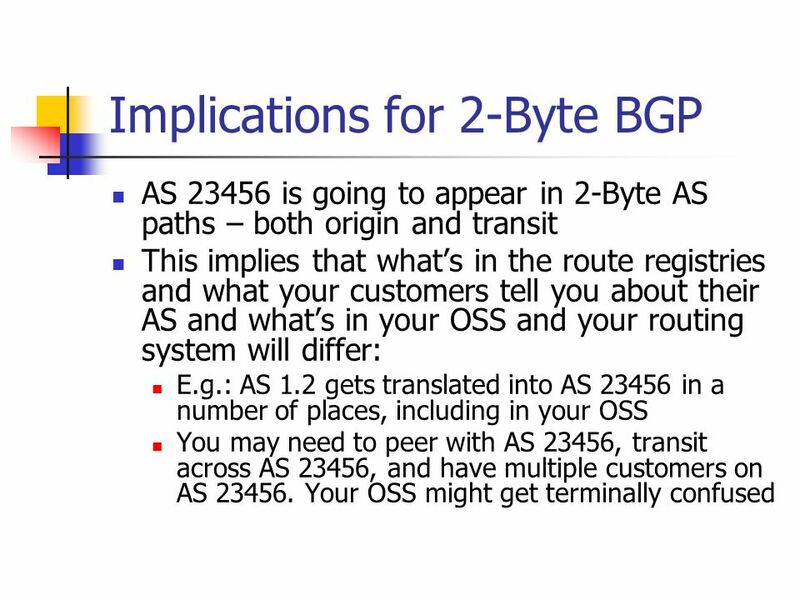 BGP01 An Examination of the Internets BGP Table Behaviour in 2001 Geoff Huston Telstra. 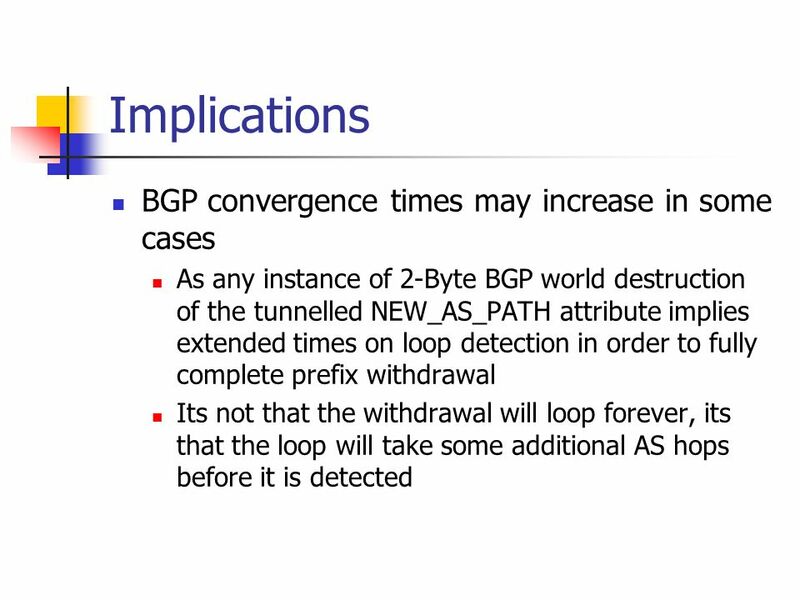 BGP Table Analysis (even more!) Geoff Huston. Interpretation There is no synchronized overview of the entire connectivity and policy state of all parts. 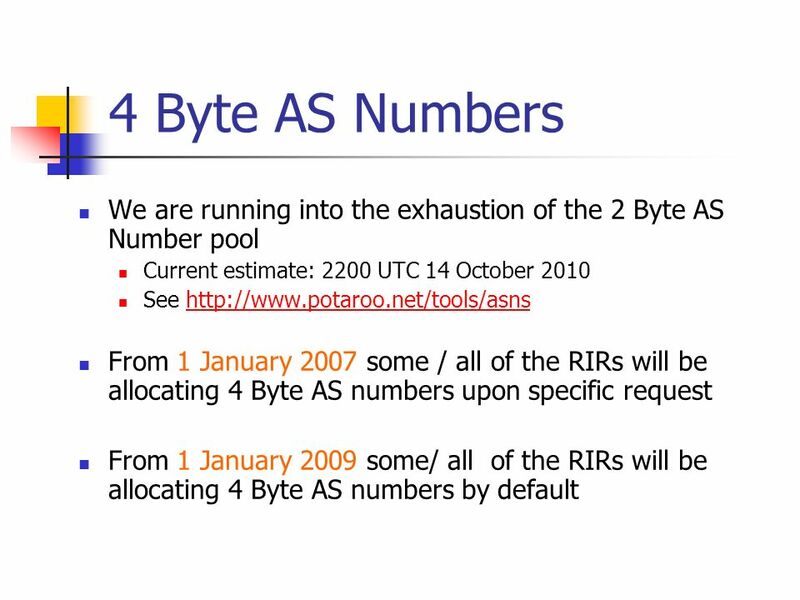 Geoff Huston, APNIC March 2006 APRICOT 2006 IPv4 Numerology. Deprecating ip6.int DNS Operations SIG Feb APNIC19, Kyoto, Japan Geoff Huston. 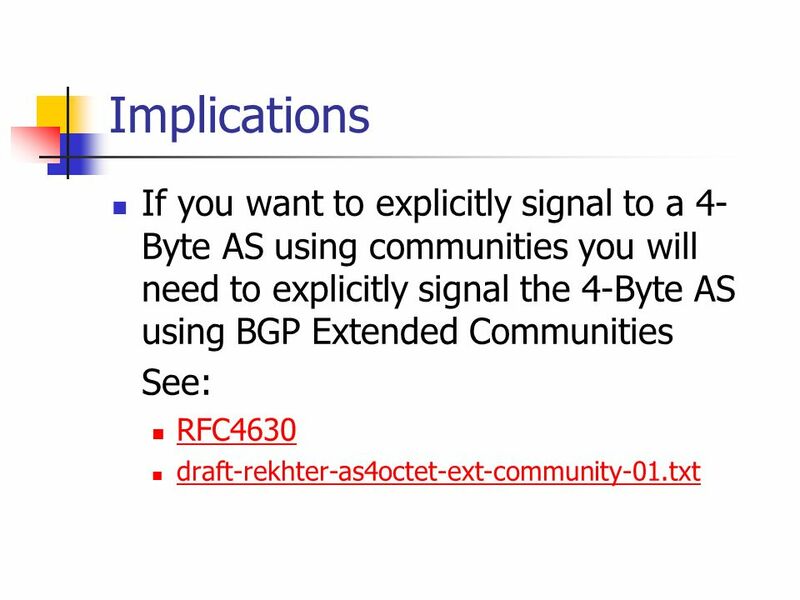 BGP AS Number Exhaustion Geoff Huston Research activity supported by APNIC March 2003. 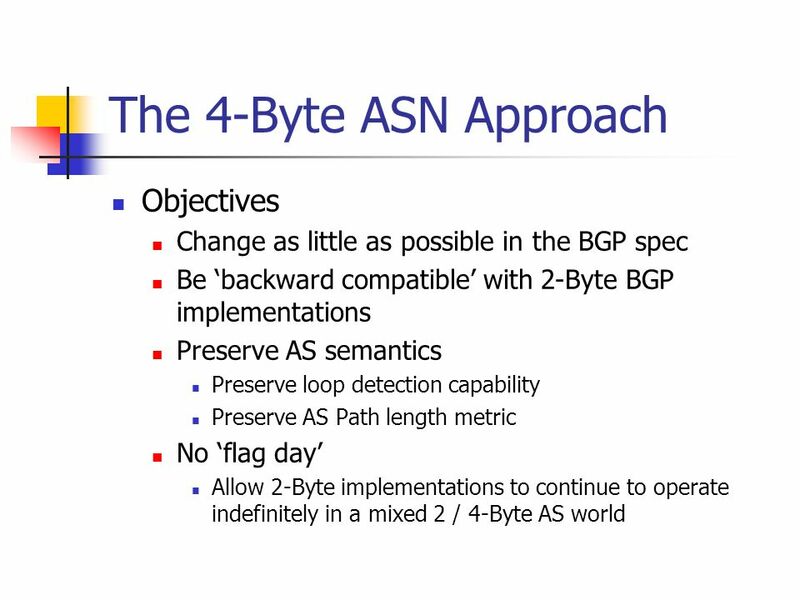 4-Byte AS number registry Policy Proposal [LACNIC Proposal ] Geoff Huston APNIC 25 May. Routing Items from IAB Utrecht Workshop Geoff Huston IAB. 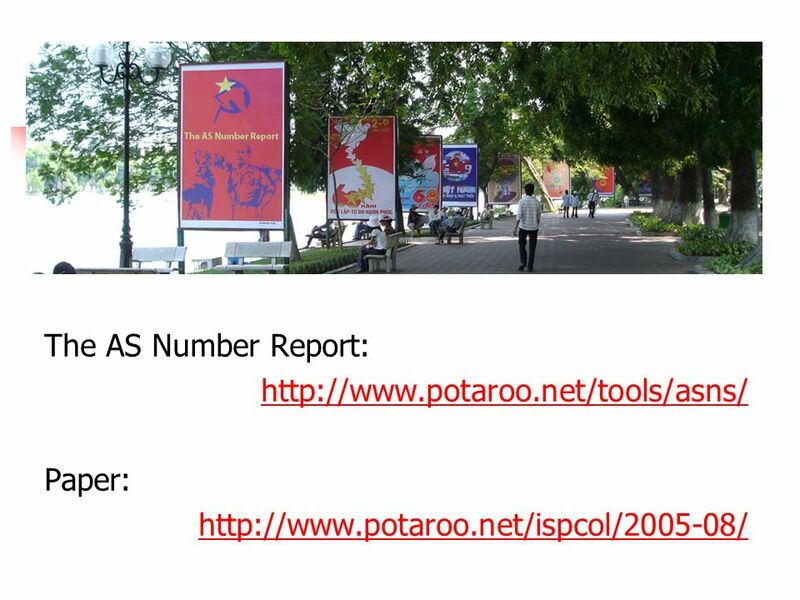 Routing Table Status Report November 2005 Geoff Huston APNIC. 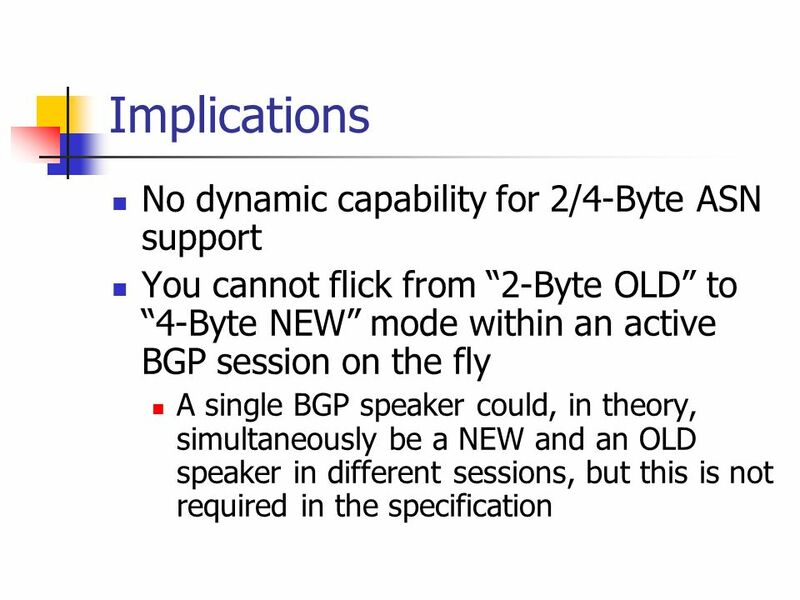 Comparing IPv4 and IPv6 from the perspective of BGP dynamic activity Geoff Huston APNIC February 2012. 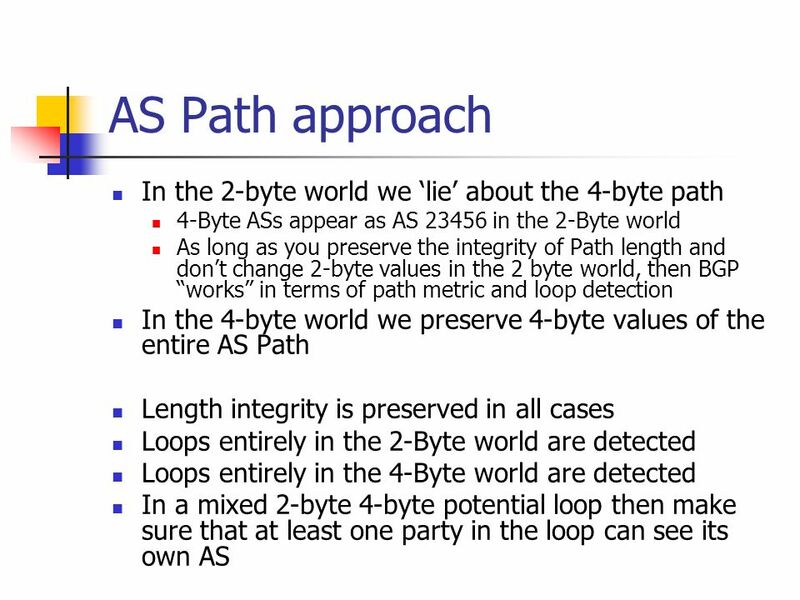 1 Copyright  1999, Cisco Systems, Inc. Module10.ppt10/7/1999 8:27 AM BGP — Border Gateway Protocol Routing Protocol used between AS’s Currently Version. 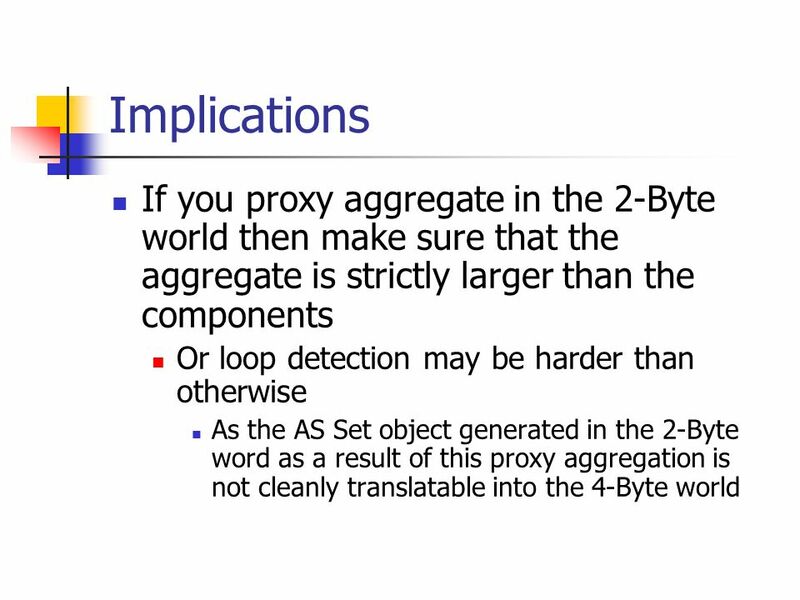 ROAs and Detecting “Bad” Originations Geoff Huston SIDR WG IETF 74. 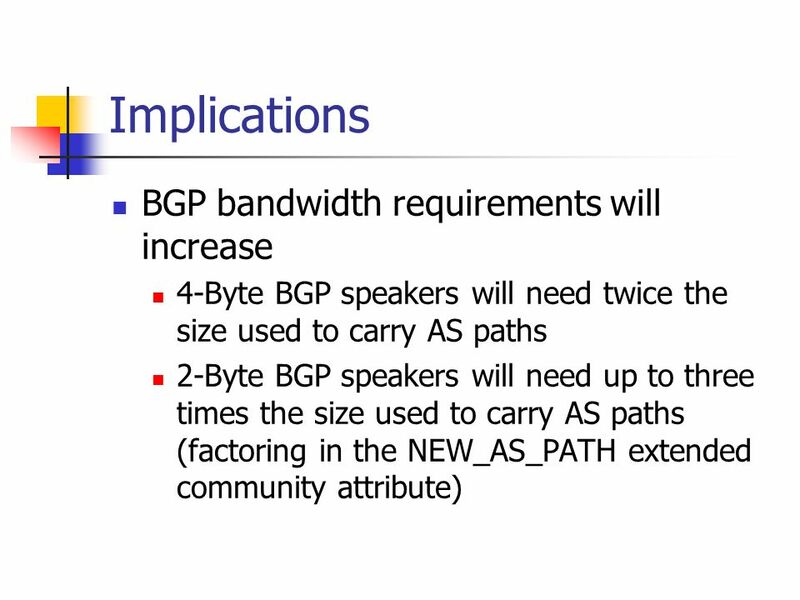 BGP update profiles and the implications for secure BGP update validation processing Geoff Huston Swinburne University of Technology PAM2007 5 April 2007.